Welcome to the Kingdom of Animalia! 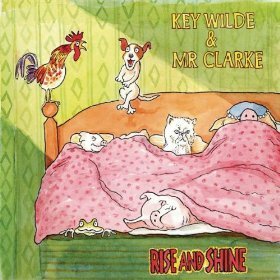 Key Wilde & Mr. Clarke (KWMC) are back and this time they have a whole new cast of animal characters for you to meet. Animal Tales is the duo’s fourth album and one that you should expect to spend a lot of time with because it’s just that good. We have had it on repeat for over a month now and I still learn something new with every spin. Em liked it so much that she illustrated her own book featuring every animal from the album. Now that’s love! She even insisted on contributing her own thoughts “for other kids!” which is featured at the end of this review. As always, the brilliance of KWMC’s work can be found within the fine-tuned details. Whether it’s Wilde’s gorgeous illustration that graces the album’s cover or the skillful way each song is constructed, it’s clear that this talented duo puts a ton of thought into their work. Imagine if you were to open a National Geographic Kids or Ranger Rick magazine and there was music playing on each page. Animal Tales takes the pages of these beloved magazines and brings them to life with soundtracks that are cleverly matched to a variety of animal personalities. 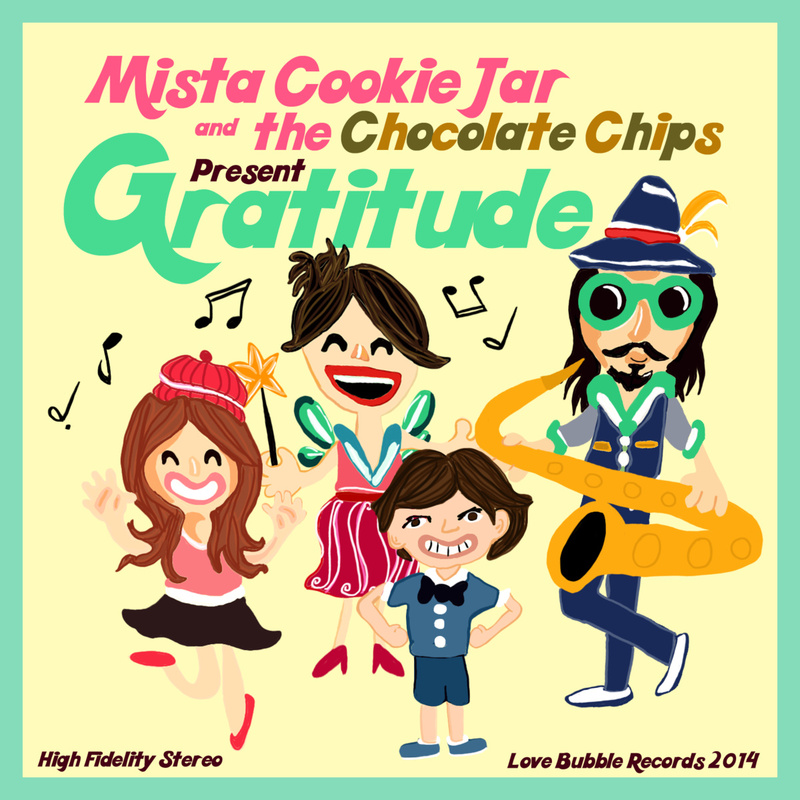 The songs are rich with fun animal facts that also include the the artists’ lovable sense of humor and clever ability to play with words and phrases, making it one of the most listenable and entertaining albums out there. “The Buck Stops Here,” is a prime example of these guys totally nailing it. While most of the 13 tracks on the album relate to animal stories, there is also support for wildlife conservation, reminding us of the challenges animal’s face whether it’s due to population decline, habitat changes or environmental challenges. “The Bear Song,” one of our favorite songs, teaches about 8 species of bears throughout the world.There’s even a shout out for the sugary kind. Do you know the color of a Polar Bear’s skin or which bear sings her cubs to sleep? The song and its accompanying video were created in collaboration with the Woodlands Wildlife Refuge, a non-profilt wildlife rehabilitation facility dedicated to the care and release of orphaned and injured wildlife. Emily loves this song so much that she actually said to me “mama, be quiet and listen to the facts.” I mean, that’s for real. Animal tales is truly an album for families to share. Listeners will be treated to a musical expedition accompanied by a bountiful supply of fresh tracks that both educate and entertain. You’re always taken on a wild adventure with this dynamic duo which is exactly why we love them. Emily’s Take: They always know what to do about soaring things in the sky and on land. Bears, birds and bees, squirrels and frogs. Things you don’t know about animals you get to learn! They make children laugh. It’s kind of funny when you think about a cat named Beastapuss. Animal facts are fun. – Key Wilde has done artwork for Avanti Greeting Cards, the Central Park Conservancy and the Woodlands Wildelife Refuge which was featured in a book called Broke Leg Bear, a true story about a badly injured cub who was rehabilitated and released back into the wild. Learn more and purchase the book here. – KWMC’s “Animal Alphabet” video has reached over 660,000 views! 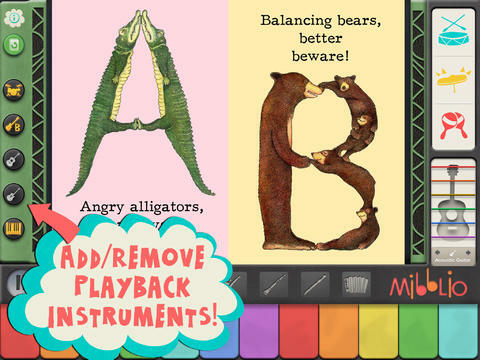 The song is also featured in a Mibblio app along with Wilde’s beautiful artwork. Meet Armando Armadillo from last week’s video release and grab a FREE DOWNLOAD of the song. You can purchase the album through Amazon, or iTunes. Make sure to follow Key Wilde & Mr. Clarke for updates via Facebook and Twitter! Today’s video premiere and free download is for the song “Armando Armadillo” by Key Wilde & Mr. Clarke (KWMC). It’s also just one of many entertaining stories from their latest release, Animal Tales. 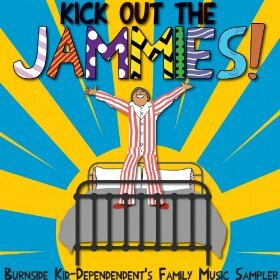 What you will love about it: The illustrations and animation, clever sense of humor and wacky Armadillo facts! Key Wilde & Mr. Clarke’s attention to detail is what consistently sets them apart. What you will find in this video, as well as the rest of Animal Tales, is KWMC’s uncanny ability to tap into a rich, imaginative space that takes listeners/viewers on an adventure along with the characters they create. By presenting a relatable narrative, paired with beautiful artwork, viewers will feel as though Armando is their friend. What you should know: “Armando Armadillo” is a cautionary tale about a hard working Armadillo who lives with is wife and 12 children (3 sets of identical quadruplets) in a Nacogdoches (Texas) burrow. Viewers will get a chuckle as they are introduced to Armando’s family through a Brady Bunch style grid and as they watch Armando weave his way across the highway with Frogger-like style. Behind the Scenes: The entire video was illustrated and animated by Key Wilde. Grammy winning producer, Dean Jones, joins in on the guitarron contributing to the Mexican flair of the song. Want to learn more? Of course you do! Head on over to Facebook and “like” Key Wilde & Mr. Clarke’s page to stay up to date with what they are working on and where you can see them perform. You can also follow them on Twitter. Key Wilde has done artwork for Avanti Greeting Cards, the Central Park Conservancy and the Woodlands Wildlife Refuge all of which can be found in Key Wilde’s portfolio. I highly recommend checking out his work, as well as KWMC’s Animal Alphabet iPad app and “Animal Alphabet” video. Stay tuned for my full review of Animal Tales which is akin to an audio version of a National Geographic Kids magazine. In the meantime, you can download “Armando Armadillo” for free through the Soundcloud link below. 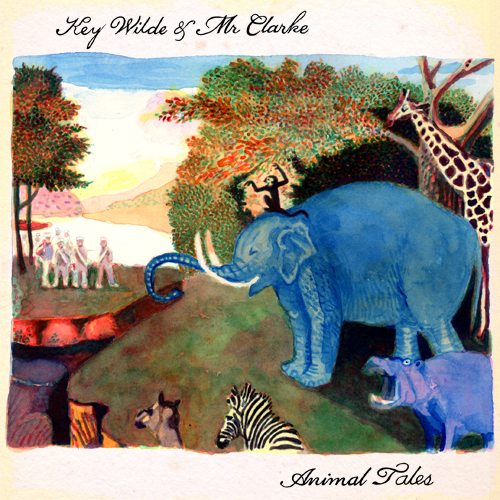 It’s National Reading Month and to celebrate Key Wilde & Mr. Clarke you can listen to a bit of their rockin’ song, “Animal Alphabet” from their highly acclaimed release, Pleased to Meet You. 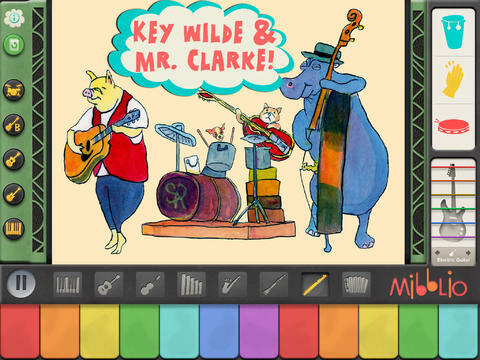 Additionally, Key Wilde & Mr. Clarke have paired up with Mibblio to produce an Animal Alphabet mibblet (Mibblio’s animated musical story book) for iPhones and the iPad. 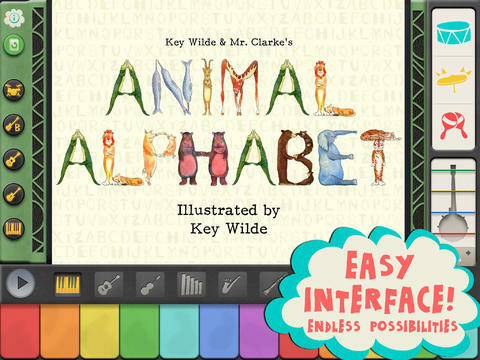 Through gorgeous illustrations and clever use of alliteration, Key Wilde & Mr. Clarke’s “Animal Alphabet” sets in motion the foundation for language development and reading. 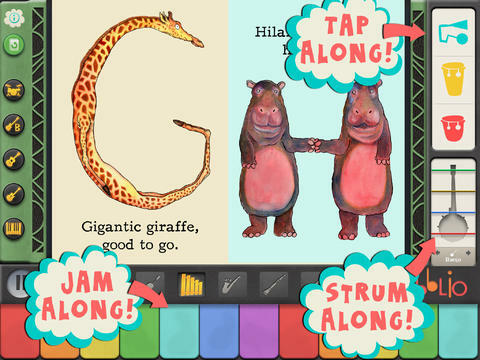 Although there are many renditions of the alphabet song out there, Key Wilde & Mr. Clarke quickly capture their audience’s attention with creative language like “…nautical narwhals nuzzling noses.” And thanks to Mibblio’s interactive musical interface, kids can jam along with the animal alphabet band, too. When we were done jammin’ with the band, Em and I made good use of the mibblet’s pause button to practice reading at our own pace while further admiring Key Wilde’s glorious artwork. This is one artistically arranged animal alphabet adventure you won’t want to miss. Although, Key Wilde & Mr. Clarke just released the adventurous Pleased to Meet You, I couldn’t wait to post this video once I read a portion of the bio from their site. From their 2010 release, Rise and Shine, “Rattling Can” deconstructs a bottle of juice right down to the quarks that make up its composition. Usually I like to add my own commentary, but I think reading about the song, in KWMC’s own words, really sums up the energy of it all. Learn more about this dynamic duo at their official site and purchase Pleased to Meet You through Amazon and iTunes.